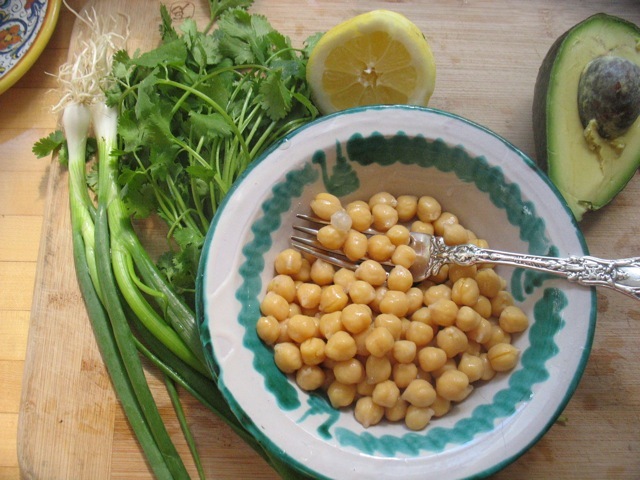 Cooked chickpeas are mashed together with avocado, cilantro, green onion and lots of lemon juice. 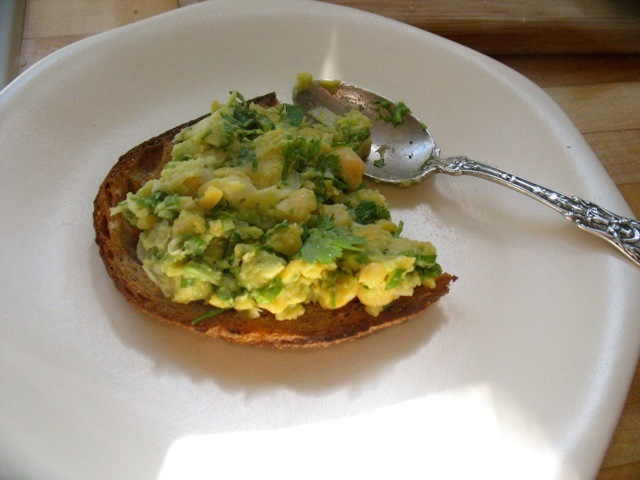 Eat by the spoonful, on/between toasted bread, in a tortilla, as a dip. . . .you get the point. It’s delicious and versatile. Time has been short for my lately, hence my long absence here. I’ve been consumed with all sorts of projects and I have missed this place. So, hello again! These busy weeks have had a few silver linings, one of which was that I was probably living more like many of my students (and possibly readers) who have far less time than me to spend in the kitchen and less time thinking about what to make for ourselves and our families on a daily basis. And thus I have gained a bit of perspective and have some new ideas about how to eat well and with minimal stress (and minimal processed food) in times of heavy workloads. Yesterday I taught a class as part of the Wellness Program for county employees. Many of them work 10-hour days and getting a healthy, delicious meal on the table is really a stretch. I taught three things (a frittata with snap peas, herbs and feta; an arugula, white bean and tuna salad, and this chickpea avocado dish). They were all devoured but this one was met with the most initial skepticism and then maybe loved the most–for its adaptability, speed, and flavor. I also love this dish because it uses herbs in great, heaping quantities. I’m teaching an herb class in July because I’m almost as much of an herb evangelist as I am a bean evangelist. If you have pre-cooked chickpeas on hand (or you can use canned ones after rinsing well) this comes together in minutes. I got the idea for this salad/spread/dip here and have since made it with mint instead of cilantro, green garlic instead of green onions, cumin and smoked paprika, and Serrano chilies and lime juice instead of lemon. You can mash it really well for an almost hummus like consistency or leave it chunky. You can thin it down with more bean cooking liquid, water or more juice and olive oil. You can make a big batch and have it for lunch several times in a row. . . .In other words, it’s a perfect cook-with-what-you-have/like candidate. You can just gently mix all ingredients or mash them together well for completely different consistencies. This is delicious as a dip, on toasted bread, as a sandwich filling or just as is. You can adapt this in many ways too—add your favorite hot chilies or hot sauce, different spices or herbs, etc. See more ideas for variations above. I particularly like using mint or basil or a combination. Tarragon and chives are good and so is parsley. Mash the chickpeas in a bowl, add all the remaining ingredients and mash some more and mix well. 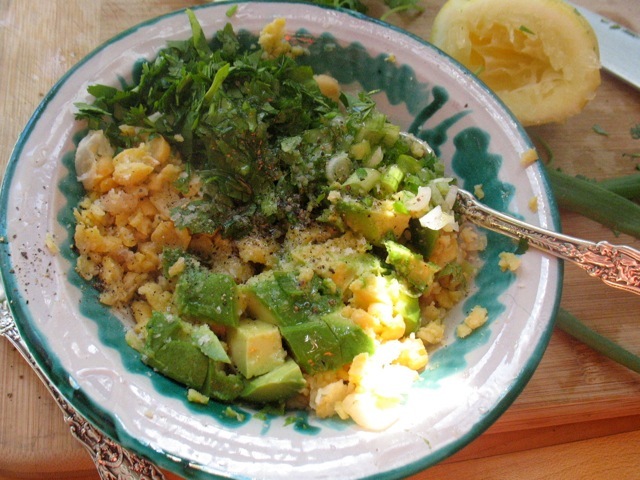 If you want to serve it more like a salad or side, just lightly mash the chickpeas and dice the avocado and mix everything together more gently. You don’t need to achieve such a uniform texture in that case.